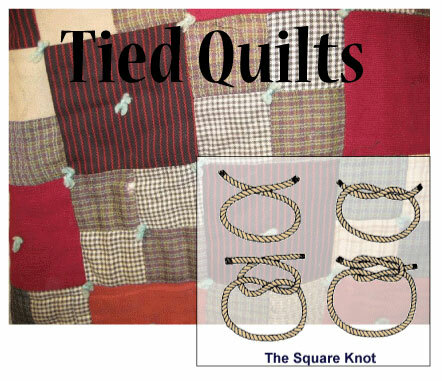 Tied quilts are an old tried and true method of holding the 3-layers together to make a quilt. While I have quilts from both my grandmother and two of my great-grandmothers - my mom only 'tied' her quilts. What? My mom wanted to get quilt finished! The fastest way to get a quilt finished is to 'tie' the quilt. My first few quilts were hand-quilted. My youngest daughter figured out pretty soon that to get her quilt done 'in her lifetime' was to have it tied. I hate to admit, but as a beginning quilter I did most things 'wrong'. Well, wrong as in my grandmother wouldn't have done it that way- LOL. With Lindsey's blue and yellow spool quilt, I did all the cool piecing, added borders, but then to finish it up in a timely manner, I used Yellow Polyester Yarn to do the ties. Hey, it is now 30+ years later, and while the fabrics have faded a bit, but the quilt is totally intact and will last another 30 -70 years. What more could you ask? You can tie together the layers of your quilt sandwich instead of quilting it. I confess, I’’m not a big fan of tying, but it does have its uses, and a certain old-fashioned charm that can make a quilt extra special. Tying is not as durable at holding the layers together as quilting, so take extra care when washing the quilt not to stress and stretch it. Tying can also be hard on your hands, so take breaks if you are working on a large project. Use a heavyweight thread, such as pearl cotton or embroidery floss, and a heavy needle such as a sharp-tip tapestry needle. If you do a lot of tying, there are some curved needles on the market that are well worth the investment. The curve makes it easy to take the stitch to the back and front in one move. As noted above, my first tied quilt I used cheapo yarn and it holds up well. Check the batting specs to see how closely it needs to be secured, and plan on placing your knots at least that close together. Baste the layers together just as described for quilting. You can hand baste, but I always pin baste because I can do that faster. 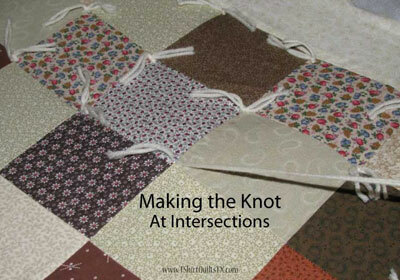 When tying a quilt, the knots can be made either on the front of the quilt or on the back——it’’s completely up to you. If you don’’t want them to show, knot from the back. If you want the ties to enhance the quilt, knot them on the front. Start at the center of the quilt and take a small stitch, about ¼" long, through all the layers. (Some quilters will take two stitches, one on top of the other). Leave about a 2" tail. Pull the thread through and cut it, leaving another 2" tail. TIP: If your ties are at least 4" apart, you don’’t have to cut the thread before you move on to the next tie. Just let the thread float over the quilt top to the next tie location. After all of the ties have been stitched, carefully cut the thread halfway between each tie, and then make your knots. Make a square knot (right over left and under—; left over right and under) or a surgeon’’s knot. A surgeon’’s knot is just like a square knot except you make one more wrap at each step. Trim the tie ends if they seem too long. A decorative option would be to insert a button in all or some of the ties. The button can be on the side of the quilt with the knot (my preference) or on the backside. 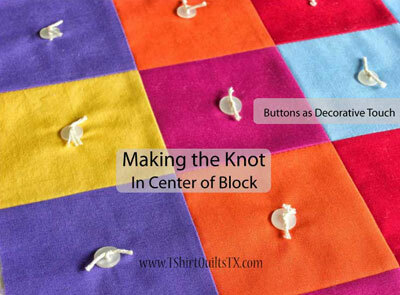 The knots are made the same way whether you add buttons or not. I would not do this on baby or young child quilts, if possibility they might chew on the buttons. Shadywood Quilts/T-Shirt Quilts of Texas have been in business for over 15 years. We are happy to help you finish your quilt project. For more information about having a quilt professionally finished, just contact us and ask your questions.